Help! There's a Piece of Windows in my Mac OS X! And it's even OFF by default... Steve, save us from whatever pointy-haired manager thought this was a good idea! After receiving some clarification and doing some research on how Apple has in fact gone about implementing this feature in Mac OS 10.1, I have reconsidered many of my opinions on the subject. Foremost in importance in changing my mind is the thought that Windows users resent Macs because the files they get from Mac users never have extensions-- and we want Windows users to like Macs, not resent them. So after discovering some of the rather interesting ways Apple has tackled this problem (no, it's not a simple matter of "chopping off everything after the final dot"), I have sent a piece of feedback to Apple outlining my revised opinions. Naturally, this all may seem a bit petty compared to the scale of the world events that now occupy all our thoughts... but at the very least I wanted Apple to know that my faith in their ability to design software the "right" way, while it was shaken for a while by the issues I wrote about on August 2, is for the most part restored. One thing is clear, at least, from the public history of Mac OS X to date: The Feedback page does indeed work. Apple listens to the reports people send in. What we say to Apple does make a difference, and so Mac OS X will indeed become one of the most community-designed commercial operating systems in history. However, one other thing that's clear is that Apple is capable of misinterpreting some of our comments, misunderstanding some of the issues we bring up, and implementing ill-advised solutions that aren't as well thought out as they could be. I'm thrilled by most of the upcoming features and enhancements in 10.1 (http://www.apple.com/macosx/newversion). The update promises to bring performance and functionality that we've only dreamed of to date. Almost all of the proposed changes listed on that page are excellent-- all except one. They propose to add an option to hide filename extensions. This is a terrible idea, both from a user interface and usability standpoint and from a security and functionality standpoint. It's a regrettable Windows-ism that has led to all kinds of problems in Windows that could have been alleviated quite easily at the outset with a better initial design-- a design that the Mac OS has always had, and now is only missing because of time-to-market concerns (I hope). Hiding filename extensions is a bad, bad, BAD design concept-- a band-aid over a shoddily designed app binding system, and the Mac OS can do without it. Many users will think "Oh, good, they're giving us an option. New options are good." Well, first of all, more options are not necessarily a benefit. A major part of what makes the Mac OS what it is is its ease of use and its well-designed user interface, which comes from a carefully chosen set of options being presented-- only those that the user needs, with anything more complex hidden in "Advanced" panels. Giving the user the option to hide filename extensions is just asking for trouble. We'll have new users bewildered by the concept of files that are named one thing in some circumstances, and another thing elsewhere. We'll have tech support people trying to work around that additional level of complexity when trying to track down system problems. We'll have chaos, much like Windows users already have. Windows power users always say the first thing they do when they install a new copy of Windows is to turn off the "hide filename extensions" option. But power users are a very tiny minority, and the rest of the world has yet another mysterious bit of computer trivia to contend with. The Apple page claims that the new option is to benefit "long-time Mac users who prefer working without [the filename extensions]". This is simply NOT the way to provide that benefit. Power users who prefer to work without filename extensions will simply remove the extensions by renaming the files, NOT by flipping some global switch somewhere that puts masking tape over the files' labels. In my Movies folder, I have files with names like "allyourbase.swf", "Terrible Secret of Space", and "ninjakitty.mpg.mpeg"... some of which I want to keep with their extensions, some of which I don't. A global switch wouldn't do me any favors here. I want to see the extensions on the files that I will be transferring to other platforms, but I want to be able to remove the extensions on my OWN files-- the ones that I'll only be using on my Mac, or sharing with other Mac users-- and have the file still retain the proper icon and remember which app to open in. With type/creator codes properly set, like it always has been, that's what will happen anyway. My Movies folder: the way things ought to be. If we allow extension hiding in Mac OS X, we'll end up creating files like that "ninjakitty.mpg.mpeg" I mentioned-- probably created or saved by someone who perfectly innocently got confused about whether he was on a machine with extensions hidden or without. Do we want to go down that road on the Mac? And what about Outlook viruses? Many of them are designed to take advantage of exactly that confusion. There's one making the rounds right now (SirCam) that sends out attached files with names like "essay.doc.vbs" and "Picture.gif.lnk", and most users react with the knee-jerk "Oh! A .doc file... that opens in Word!" and innocently double-click on it. 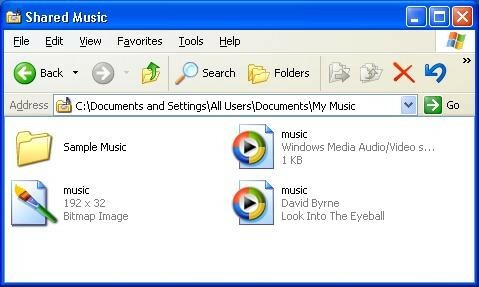 If we start down that slippery slope, very soon we'll be just like Windows XP, which installs by default with a "Shared Music" folder that has three files in it called "music"... actually they're music.asx, music.wma, and music.bmp, but the extensions are helpfully hidden. Thank you so much, Microsoft. The feedback that Apple is responding to is from people like us who noticed that some of the NeXT-derived apps that Apple bundles into the OS-- TextEdit, Mail, Preview, and so on-- don't set type/creator codes, and rely on filename extensions to map files to themselves. If you remove the extensions, the files lose their icons and app bindings. That's a ludicrous throwback to the 80s by comparison to the robust and flexible system of type/creator codes and default icons and the Desktop database, and MacInTouch readers kept up the outraged rhetoric about it for weeks-- but eventually we all agreed that the fact that these apps didn't support type/creator codes was most likely due simply to the apps' legacy nature and the short development time. New versions of these apps and Cocoa that fully support the type/creator code API are sure to be forthcoming. But Apple took our complaints to mean simply "We don't like to see filename extensions!" rather than "We don't want our applications to rely on filename extensions instead of type/creator codes!"... and they helpfully tried to "solve" this by offering to hide the extensions. This doesn't do a thing to address the underlying weakness of design that results in having to rely on the extensions. It's a quick and dirty piece of deception that lies to the user. It's like customers clamoring for Ford to put a V-8 into one of their 4-cylinder models, and Ford responding by putting a "V-8" sticker on the car's fender. It's important to realize that it's potentially even more dangerous on the Mac than on Windows for filename extensions to be hidden. On Windows, if you see a file with a "picture" icon and a filename like "picture1", you know that the system has extension hiding turned on-- because the file wouldn't have the proper icon otherwise. On the Mac, what you see is what you get-- the filename is as shown, with no hidden trickery or extensions lurking up the OS's sleeve, and no constraints on what the file has to be named. But in Mac OS 10.1 with extensions hidden, if you see a file called "picture1" with the Preview icon, you have no idea what the file's real name is-- it could be "picture1.gif", it could be "picture1", or it could even be "picture1.foog"-- and it will still open in the proper app and have the proper icon if the type/creator codes are set properly. Those are all valid names. ALL names are valid. The Mac even allows custom icons, which even further confuses the issue-- IF extensions are hidden. But everything "just works" if extensions aren't allowed to be hidden. There are two kinds of files we need to be talking about here: files that are native to the Mac OS and not likely ever to be transferred to a non-Mac platform; and files that are intended to travel between platforms through the Web, e-mail, and other transfer methods. Likewise, there are people who create content for cross-platform use, and there are people who don't. I contend that people who create content for use on the Web understand how filename extensions work on other platforms. They don't need to have their hands held. They've never been confused by extensions on files they download or create in programs that attach extensions for them. They *need* those extensions to help them create accurate Web content. They need to know the filenames as they truly are. But users who don't create such content-- well, they'll be working primarily with Mac-only files, and so they don't need to have the option to hide the extensions on files. Pictures they download will tend to have .jpg and .gif extensions, but so what? If those files have the type/creator codes set properly, they can delete the extensions! The files will still work! If they want to remove the extensions from a big bunch of files, why not make that a contextual menu option-- "Remove Filename Extensions" from any selected files-- which would rename them all at once? If they want to send the files out to their Windows-using friends, applications can map extensions onto them automatically as they leave the computer so the user doesn't have to worry about it. This is OS-level trivia that computers deal with much better than people. So why make the users shoulder the burden? And if you choose to hide extensions, what about files called things like "My Diary 4.5.2001"? What would it show up as-- "My Diary 4.5"? That's not helpful. and what about "com.apple.whatever.extension" and so on? Multiple name parts abound. Why are we arbitrarily chopping off the last one when we display it? Gaah! It's just not going to work. It's not going to help anybody. What I want is to be able to take "My 2000 Taxes.pdf", chop the .pdf off the end of the file by renaming it, and have it still appear and operate the same as it did before. That's the system we had in the old Mac OS, and it was GOOD. Mac users who created files to send to other platforms have always done fine with extensions-- they've never been confused or irritated by them; they've understood that they're a fact of life for non-Mac platforms, and they've never regretted that they can't hide the extensions from their own delicate eyes. But now, we have a system where files-- even those that are part of the OS-- are improperly typed and dependent on extensions. "Late Breaking News" was always a hallmark of the Mac OS... a nice-looking filename on a file with a newspaper icon. Perfectly understandable. But now we have "LateBreakingNews.help"... agh! Gross! And if you remove the .help from the end, the file loses its app binding and icon. That's hideous. And all because the designers didn't see fit to give the file proper type/creator codes and a nice-looking filename. What we need to do is fairly simple. Have all files that are created by Mac applications require and prefer type/creator codes. Extensions should only be used on files that are destined for cross-platform use. Applications that create such files should OFFER to add an extension, but not require it-- see Photoshop for this functionality in action. Adobe got it exactly right. Photoshop gives you a Save box with the basename highlighted, and an appropriate extension for the file type appended-- you can delete it if you like, if you won't be putting the file up on the Web or sending it to a Windows user. And it sets type/creator codes so it will still open in Photoshop no matter how you rename the file, but a Photoshop-created JPEG file will still open in Preview and PictureViewer and any other app that claims to be able to open JPEG files. It's a sytem that's beautiful and elegant, and it doesn't need to be screwed with. Photoshop's Save box-- an excellent and flexible design. 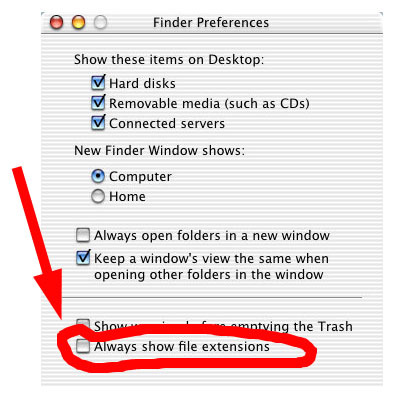 "File extensions help Mac OS X maintain full Internet compatibility", Apple's page claims. Well, yeah, but we shouldn't have to DEPEND on them. 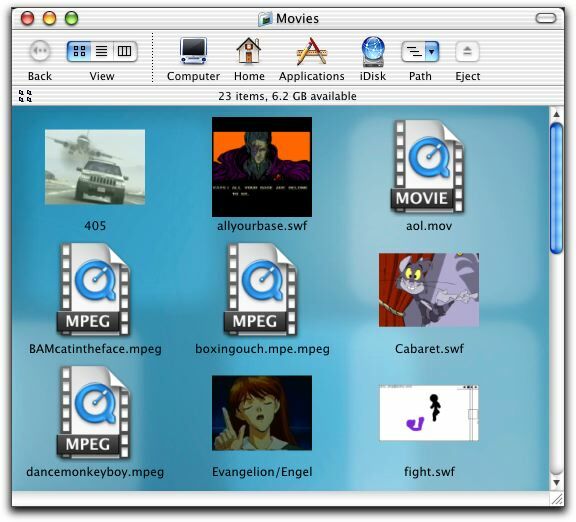 The old Mac OS had the Internet Control Panel, which watched for incoming files (entering via HTTP, mail, FTP, and so on) and assigned type/creator codes to the files according to a lookup table keying on the filename extensions. That's fine, especially if we have control over that lookup table and what apps it decides to map to what extensions (which we don't at the moment). But now, bare extensions are treated as the authoritative method for typing foreign files-- they never go through a process where they get type/creator codes. Functionally it works the same-- except if you rename the file. Take off the extension on a foreign JPEG file in OS 9, and it still opens in PictureViewer. Do the same in OS X, and it turns into a clueless blank Document. This is just plain dumb. We need the functionality back that we used to have with the Internet Control Panel. Hiding filename extensions just cripples us in that regard-- it makes it even harder to do what we really want with the files. Apple is on the brink, here, of succumbing to true Windowsian design hell by deciding to allow people to hide an arbitrary part of the displayed filenames. What we need is not to sweep the obvious design flaws of Mac OS X's current file typing system under the carpet and pretend the extensions aren't there. We need to fix the problem at its core, by making sure the Mac's ever-superior app binding system continues to be the way it's done on OS X. Hiding filename extensions doesn't do anyone any good. It will confuse new users and annoy power users. We can't even make it an option-- that will just add an unneeded layer of complexity to the system and make troubleshooting that much harder. Stupid options like hiding filename extensions were what drove me away from Windows to the Mac in the first place, and I don't want them following me here! The great thing about the Mac is that it continues to work no matter what you do to files through their exposed and mutable pieces of meta-data (e.g., filenames and icons). You can give a file whatever name you want, you can apply your own custom icon, and it doesn't blink. But Mac OS X is at a crossroads. It can either properly fix the oversights that are crippling our ability to do those things... or it can cover up those oversights with band-aids and whitewash, turning our slick, elegant system into a scarred, badly healed mess just like Windows. Apple has the final say on this, of course; they're the ones doing the actual work, and so they do deserve immense respect for accomplishing what they have so far and for so many of the other great planned enhancements. However, we do have the power to help make sure Apple does the right thing on this matter. We love our platform too much to see it wounded like this. If you're with me on this, please help me let Apple know how important an issue this is. Use their Feedback Page to ask them to remove the "Always show file extensions" option, and fully support Type/Creator codes in all bundled system apps and in Cocoa. We can make a difference! David K. Every, creator of MacKiDo, claims that both the Windows file-extension method and the Apple type/creator codes are flawed... but the Windows way much more so. Apple, Mac OS X, NeXT, TextEdit, Mail, and other names are trademarks of Apple Computer, Inc.